On Tuesday, May 3, please join the Center for Transformative Media in launching Benjamin H. Bratton’s latest titles: The Stack: On Software and Sovereignty (MIT Press, 2016) and Dispute Plan to Prevent Future Luxury Constitution (Sternberg Press & e-flux, 2015). The evening begins with a new talk by Benjamin Bratton entitled “Speculative Infrastructures/ Infrastructures of Speculation, or Weird Design and Geopolitics Tricks (You Need to Know Now).” A panel discussion between Julieta Aranda, Ed Keller, Carla Leitao, Lev Manovich, Matteo Pasquinelli, and McKenzie Wark will follow, in response to Bratton’s talk and layers found within The Stack and Dispute Plan alike. The dual book launch is hosted by Ed Keller and the Center for Transformative Media at Parsons, The New School for Design together with e-flux and MIT Press. Both titles will be available on site following the talk, panel, and discussion. In his book The Stack: On Software and Sovereignty, Benjamin Bratton proposes that these different genres of computation—smart grids, cloud platforms, mobile apps, smart cities, the Internet of Things, automation—can be seen not as so many species evolving on their own, but as forming a coherent whole: an accidental mega-structure called The Stack that is both a computational apparatus and a new governing architecture. The tenth title in the e-flux journal series with Sternberg Press, this kaleidoscopic theory-fiction links the utopian fantasies of political violence with the equally utopian programs of security and control. Both rely on all manner of doubles, models, gimmicks, ruses, prototypes, and shock-and-awe campaigns to realize their propagandas of the deed, threat, and image. Blurring reality and delusion, they collaborate on a literally psychotic politics of architecture. In this mosaic we glimpse a future city built with designed violence and the violence of design. As one ratifies the other, the exception becomes the ruler. Edward Keller is Director of the Center for Transformative Media and Associate Professor of Design Strategies at Parsons, the New School of Design. Keller is also a Principal Designer & Co-Founder of AUM Studio. Carla Leitao is an architect and writer. She is the co-founder, with Ed Keller, of AUM Studio in NY and Umasideia in Lisbon. She has taught architecture studios and seminars at University of Pennsylvania, Pratt Institute, Cornell University, City College, NY, and Columbia University. Lev Manovich is a Professor at The Graduate Center, City University of New York, and Director of Software Studies Initiative. He is the author of eight books including Data Drift, Software Takes Command, Soft Cinema: Navigating the Database, and The Language of New Media. Matteo Pasquinelli is a philosopher. 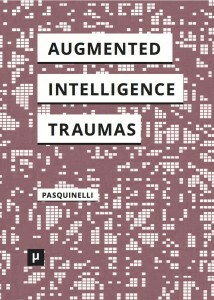 He wrote the book Animal Spirits: A Bestiary of the Commons and edited the anthologies Gli algoritmi delcapitale and Alleys of Your Mind: Augmented Intelligence and its Traumas among others. He lectures frequently at the intersection of political philosophy, media theory, and cognitive sciences in universities and art institutions. McKenzie Wark is the author of A Hacker Manifesto, Telesthesia: Communication, Culture & Class, Molecular Red: Theory for the Anthropocene, and various other things. Wark teaches at The New School. You are currently reading New York, 3 May. The Stack book launch at the New School at Matteo Pasquinelli.